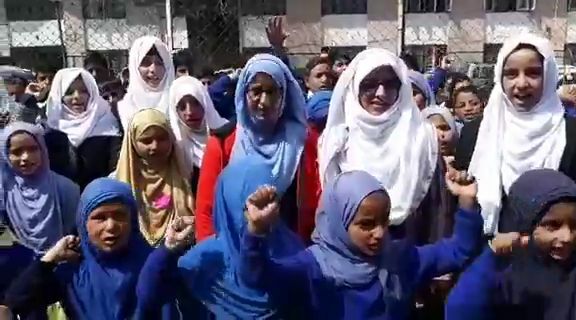 Students of Government Middle School (GMS) Frislan village of Pahalgam on Monday staged a protest demonstration in Anantnag against the lack of teachers in the institution. Scores of students along with their parents and relatives assembled in the premises of District Magistrate’s office in Anantnag and sought the government to look into the matter and provide them proper teaching facility. “We are around 200 students in the school and authorities have provided us only three teachers to teach, how will the three teachers manage two hundred students,” one of protesting students from Frislan said. The agitating students added that on the one hand Govt claims to have strengthened the education system in the valley but on the other students decry for the teaching staff in the institutions.